Panic attacks can be a terrifying experience for people. Some of the symptoms of panic attacks are very similar to heart attack and many people are rushed to the emergency room thinking that they are having a heart attack, just to find out that they were having a panic attack instead. In my practice, I have dealt with many clients who have panic attacks. When panic attacks start, they can be a horrifying experience for the client. People’s psyche does remember this feeling and what happens after many panic attacks is that the person becomes afraid of having them again. What causes the consequent panic attacks is sometimes the fear of having one again. Good news is that panic attacks respond very well to treatment. 1: First thing you need to know that panic attacks do not harm you physically. 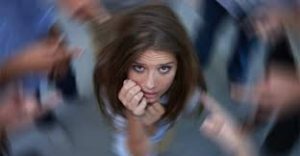 Many people are concerned about passing out or going crazy when panic attacks happen. Some people are afraid of losing consciousness, however, this never happens during a panic attack. 2: Other might think I am going crazy. No they won’t. Having a panic attacks in an internal experience not external. People who are looking at you are not going to feel what you are feeling or know what is going on. They might see you sweating a bit or being shaky but they are not going to think that you are going crazy. 3: Take a deep breath, hold on your breath, tense all your muscle and breath out as hard as you can. This will activate the para sympathetic system in the body and is a great method to calm yourself down when you feel that a panic attack is coming on. 4: Tap. Tapping is a great way to reduce you anxiety when you are feeling anxious or feeling that a panic attacks is coming on. 5: Reduce you overall stress. Sometimes panic attacks are ways that you are body is trying to tell you that you are experiencing too much stress. It is important that you listen to what your body is saying to you. Reducing your overall stress is a great way to reduce or eliminate your panic attacks. 6: Exposure exercises. I have used exposure exercises with some of the client and it seems to work very well for those who are able to tolerate it. Exposure exercises are exercises that mimic having a panic attacks (please check with your doctor first before doing any of these exercises). This can include trying to breath through a stress. sometimes I put the clients on a chair and spin them which mimics that dizziness that sometimes people have when they are having a panic attack. Once you are exposed to these conditions, your body does get used to these feelings, and when you feel these feelings it does not lead to a panic attacks. The fact is that you probably felt these feelings in your body in the past, but your psyche did not link them to having a panic attacks.